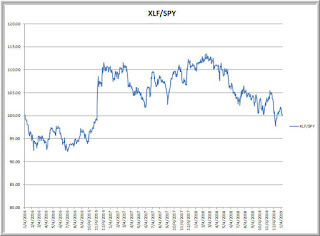 In my recent Forbes article reviewing historical patterns of bear markets, I noted that it was common to see extended bounces even within the context of longer-term declines. Indeed, we could be seeing just such a bounce in recent markets, which have taken stocks, oil, and high yield bonds meaningfully higher following significant declines. Speaking with investors and traders, I observe a high level of uncertainty and many questions. Is the decline over? Are we beginning a new bull market? Will we retest the lows? * EFA - Here we're looking at stocks outside the U.S., including Europe, the Far East, and Austral-Asia. 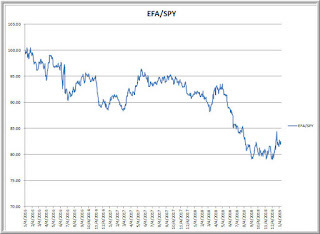 Note the ongoing weakness of EFA versus SPY. Many of the market vulnerability themes (disarray in the E.U. ; concern over Italy and debt; concern over China and trade wars) stem from overseas. 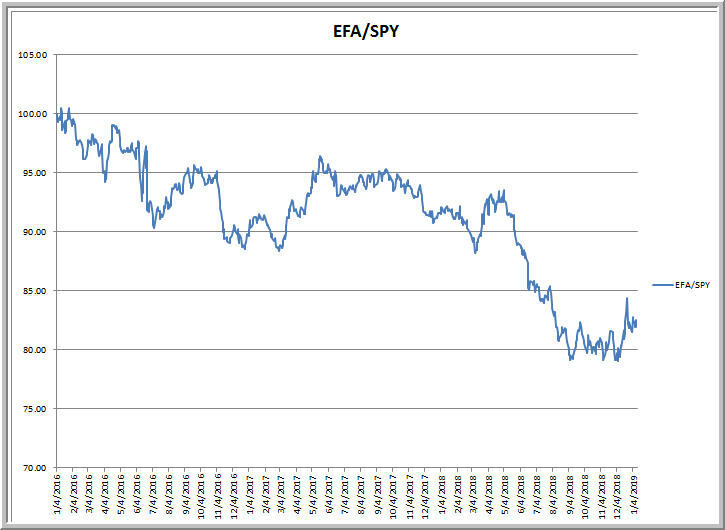 Watching the relative performance of EFA helps me walk forward, day by day, to see if those concerns are growing or waning. * HYG - This tracks high yield bonds, which have been weak for a while, but which rallied strongly on the Fed chair's recent reassurances regarding the pace of shrinking the balance sheet. 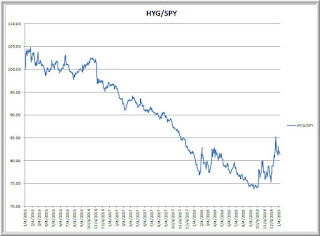 When high yield bonds decline in price, their yields rise. That is not necessarily a good thing, as it can mean that the market is pricing in growing odds of default. When we see high quality bonds (AGG, for example) outperform high yield bonds, it's a sign that smart bond investors perceive risks and seek safety. 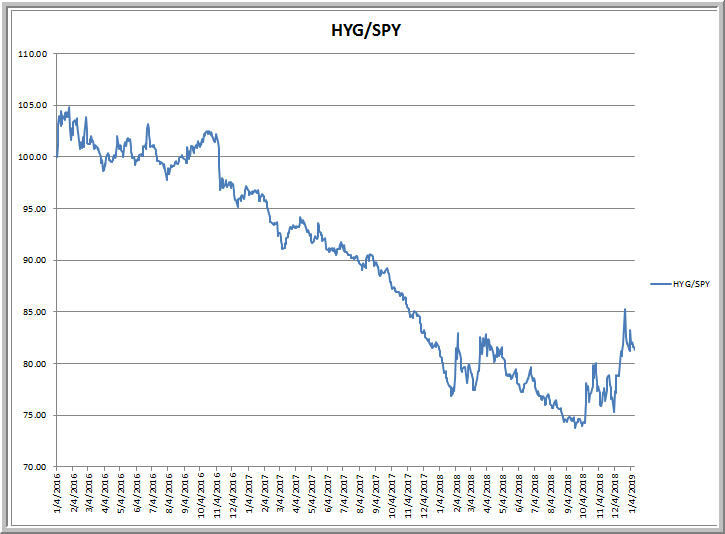 Watching the relative performance of HYG is one way of tracking their sentiment going forward. 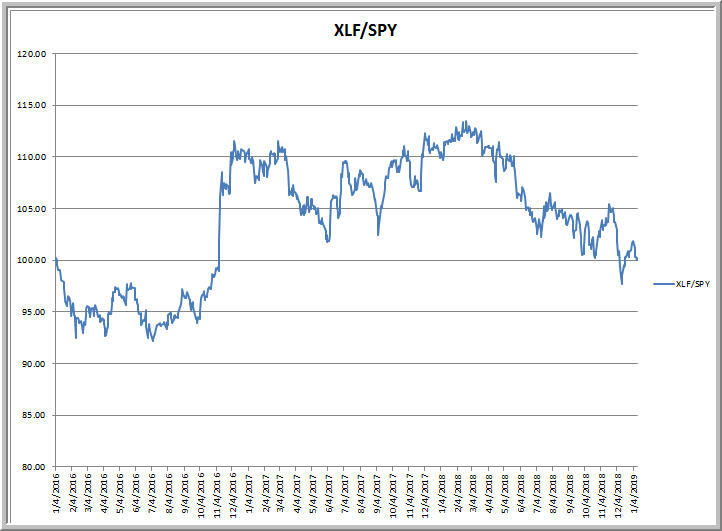 * XLF - This familiar ETF tracks the performance of financial stocks within the SPX universe. In a stable and growing economy, banks should perform well and other financial firms should benefit from loan activity and loan demand. If we encounter threats to the financial system, such as we saw in 2007-2008 with the housing crisis, then banking and financial stocks should show particular vulnerability relative to the overall stock market. 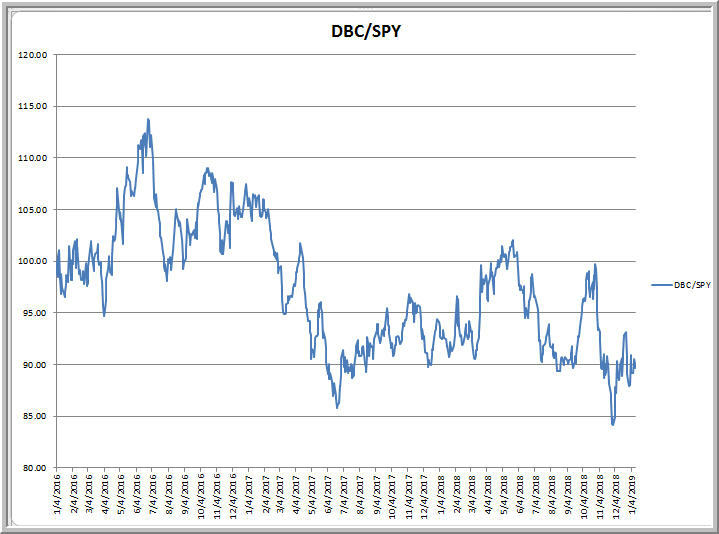 Lately we've seen relative weakness from the financial sector and a so-so bounce. I remain concerned about the European banks, which have been unusually weak: DB and CS are examples. 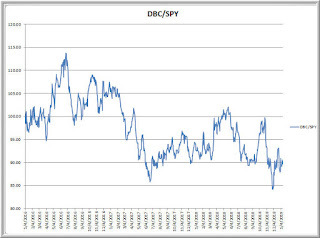 * DBC - This ETF tracks commodities and is sensitive to oil prices, which were quite weak and which have rallied nicely in recent sessions. In a growing global economy, rising production and consumption and increased building lead to an increased appetite for many commodities. Conversely, economies in recession will tend to consume less and that can lead to declining commodity prices. Oil and industrial metals are especially valuable to follow in this regard. Note that overseas equities, high yield bonds, financial stocks, and commodities are all below their 2017 levels in relative terms. Should we see economic weakness not only overseas but in the U.S. as well, these measures could weaken further. Conversely, if we retest lows and these measures hold up well in relative terms, I will be open to a more benign thesis. The key is staying open-minded and letting the evidence speak for itself. 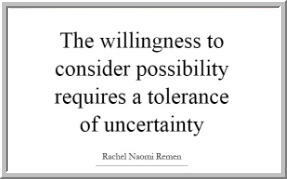 We can't be open to possibilities--and profit from them--if we can't tolerate degrees of market uncertainty.